Distinctive features: The first of a line of Texas Instruments "Slide Rule" models. Main integrated circuit - Texas Instrument TMS0120NC. 76 x 158 x 37 mm (3.0 x 6.25 x 1.5"). Introduced in November 1972, with a direct mail price of US$149.95. 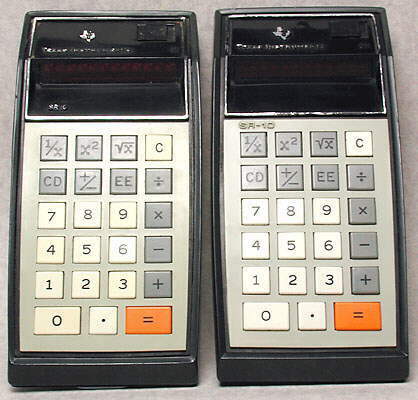 Following on a couple of months after its first calculator, the 4-function TI-2500 Datamath, Texas Instruments introduced the SR-10, its first electronic "Slide Rule" calculator. At the time most scientists and technicians used a mechanical slide rule for calculating, such as the small pocket example below. 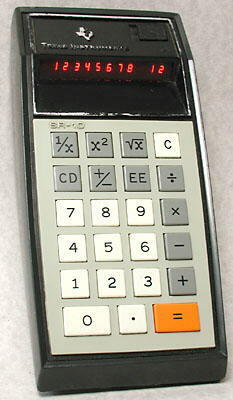 The Texas Instruments SR-10 has semi-scientific functions, comparable to the capabilities of a mechanical slide rule, though initially at about ten times the cost. There followed from Texas Instruments, and many other companies, more models of electronic slide rules, with increasing capability and reducing price until within a couple of years the mechanical slide rule became obsolete. 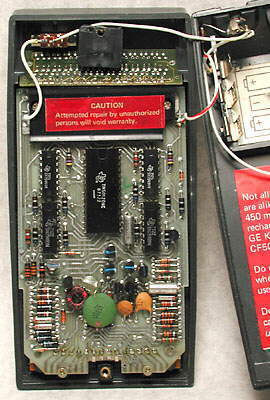 Inside the SR-10 showing the circuit board and the large number of components required at this time. The main integrated circuit is the Texas Instruments TMS0120NC calculator chip. It is surronded by four smaller integrated circuits, two SN75493 and two SN75494, which interface the low-current capability of the MOS calculator IC to the high-current requirements of the LED display. Two casing styles: on the left with the SR-10 name inside the bezel and on the right with the SR-10 name at the top of the keyboard.